With spring now upon us, we’re making a few updates to our apartment. Like most of us, there is always a need this time of year to clean-up and update. This season we are starting in the bedroom. 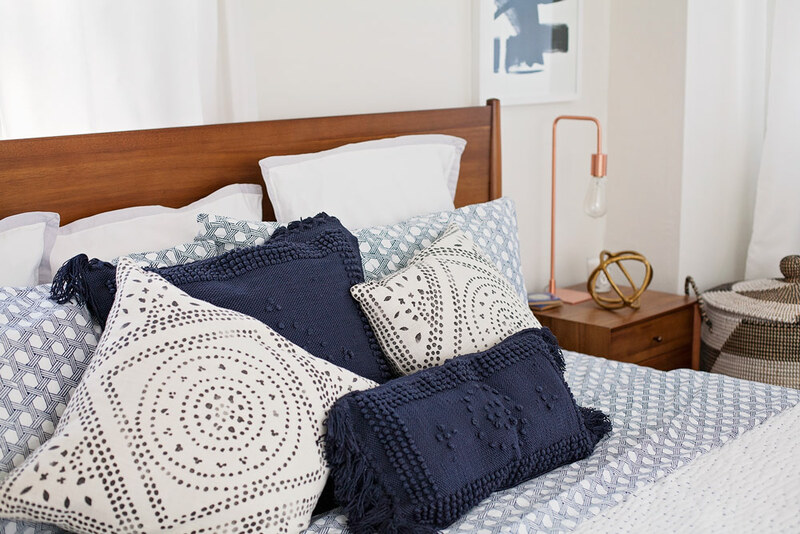 I wanted to share with you five simple ways to update your bedroom. 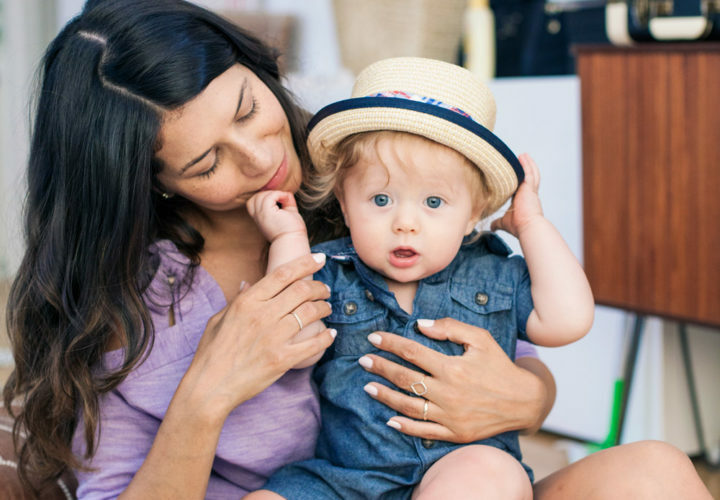 As long time customers of Serena & Lily, we are always thrilled to see their new collections. Their spring collection has produced some amazing pieces for your home including beautiful quilts, gorgeous gingham and fun textures. Serena & Lily has pieces for your entire the home, but some of my favorite pieces from their whole collection are for the bedroom. It’s so easy to dress your bed in white sheets and a comforter. Sometimes the choice seems like it’s either really boring or too bold. This is one of the many reasons I love the Serena & Lily collection, it offers the simplistic classics but weave in personality that can bring your bedroom to life. 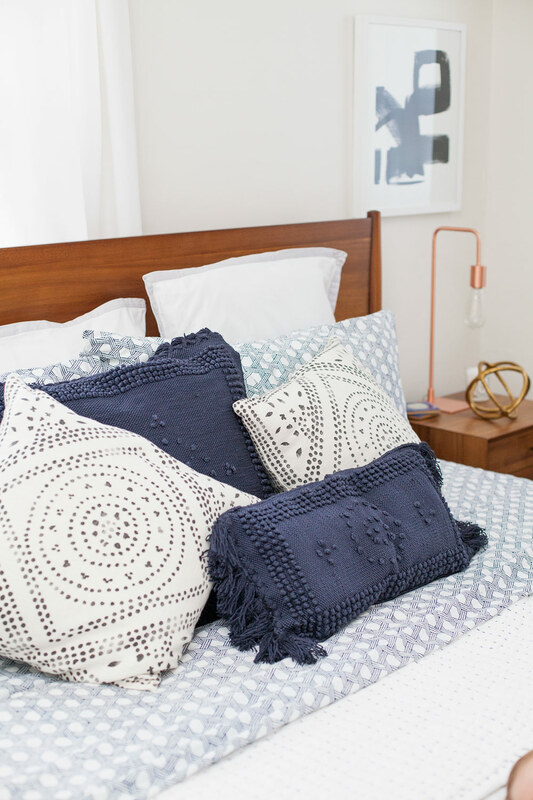 Here are five ways we have updated our bedroom for spring with Serena & Lily! 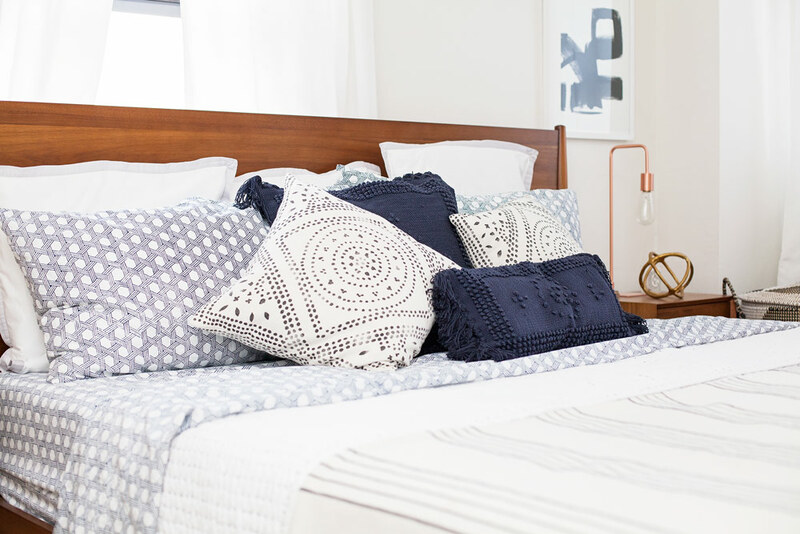 What better way to freshen up a room, than to add a fresh new pair of sheets. I love the feeling of slipping into bed with new sheets. I swear there is such a difference when your sheets are new. Since moving to a king size bed, we’ve only had one pair of sheets, so they have begun to wear out. When it comes to sheets, it’s always good to have a few in the rotation, which we now have in place. It keeps them from being overused and they will of course last longer. The Cut Circle sheets in pewter are a personal favorite, but we loved adding a splash of blue to our room with the Cayman sheets. Can’t go wrong. They have top quality sheets for whatever style you are look you are seeking to achieve. Living in NYC, you never know when the weather will change, so we love having a throw in our room now. It also adds texture to the bed and allows me to sneak in a nap without messing up the bed! The Casablanca throw is probably my favorite throw on the market. I’ve seen this throw all over Pinterest and now I know why everyone has added this to their home! 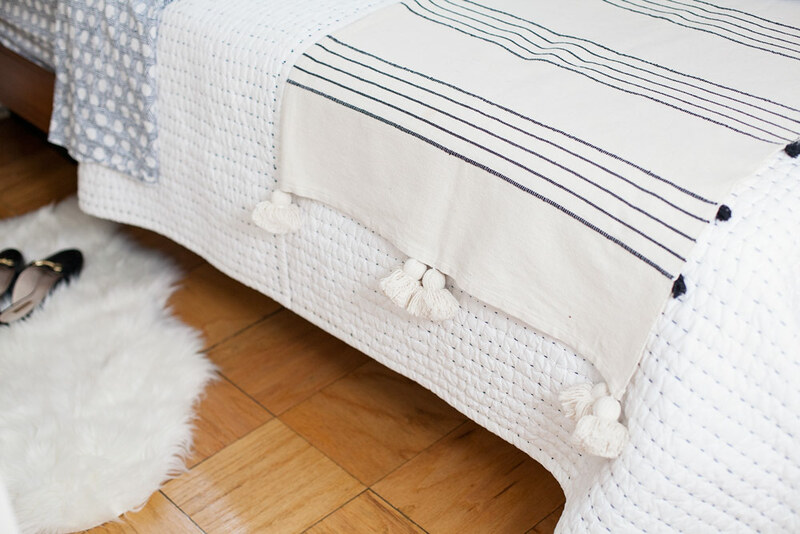 The handwoven throw with pom-pom fringe works with almost any room and just screams cozy. I probably should have started with the baskets from Serena & Lily, because they’re a family favorite. We currently have four La Jolla baskets throughout the apartment and they’re used several different ways. The blue set in Sebastian’s room are used for storage and laundry. 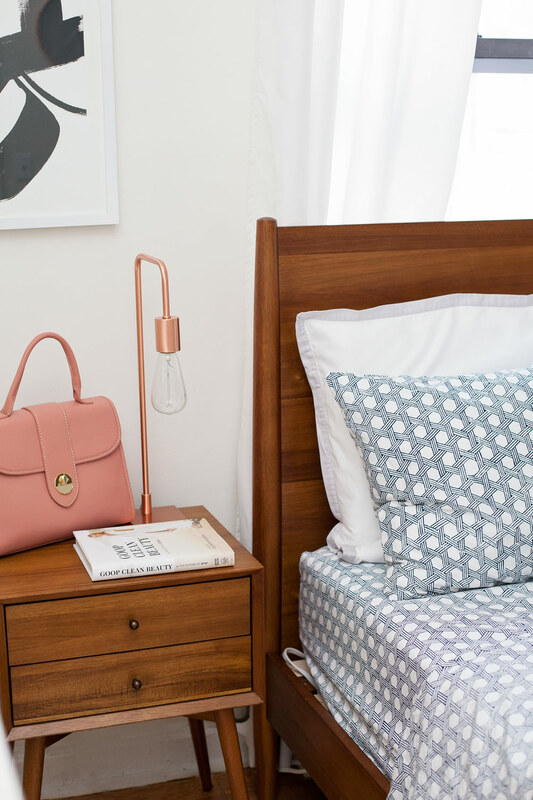 It’s an easy way to keep a small space organized, while looking modern. 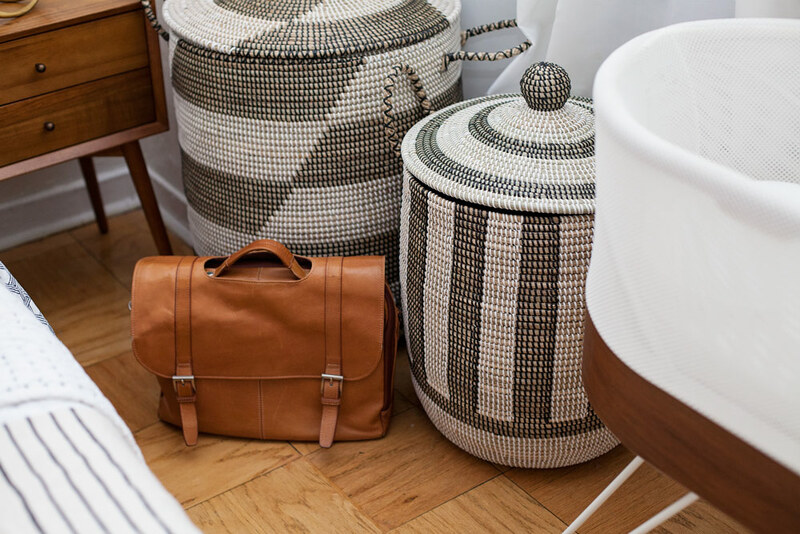 As for the two in our bedroom, we opted for the La Jolla baskets instead of a small rocking chair. We thought having extra storage was more beneficial than a chair that collected clothes. Thus far, they’ve proven to be a huge success! The larger basket is used for laundry and the medium basket is used for extra sheets and throw storage. 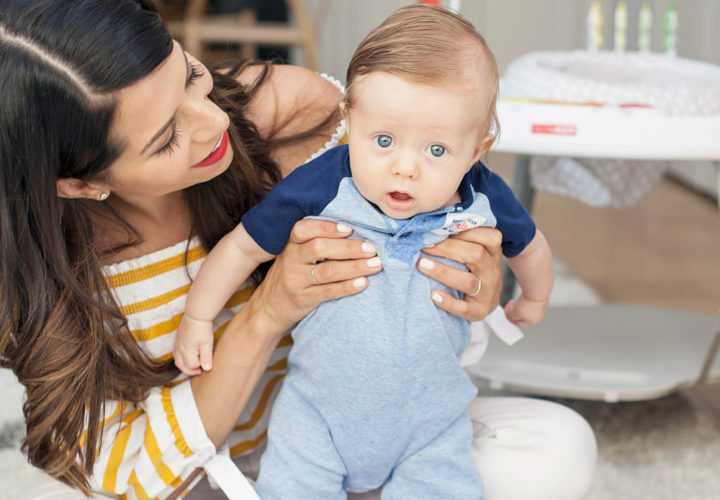 Be sure to measure your space before deciding on a size. We have the large and medium in both our room and Sebastian’s room. I love accent pillows! 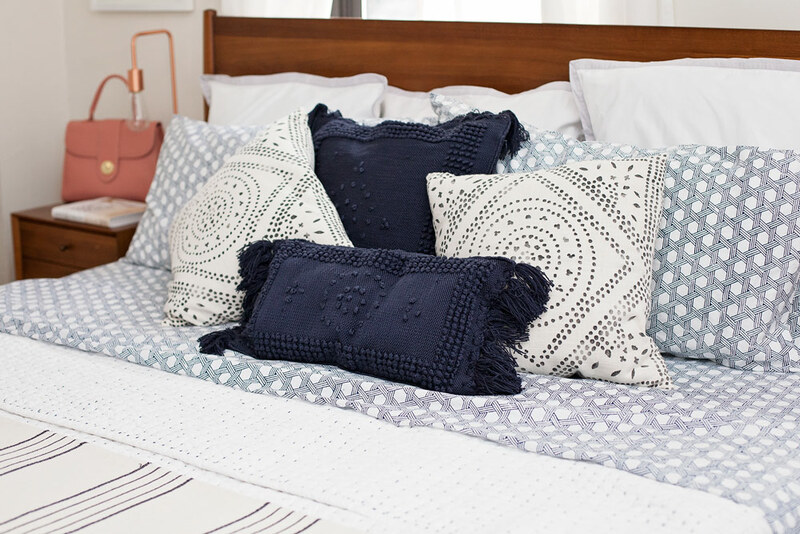 However, finding pillows that go with multiple rooms can be even super difficult. Living in NYC, we need pieces that are interchangeable, especially when it comes to seasonal pieces. 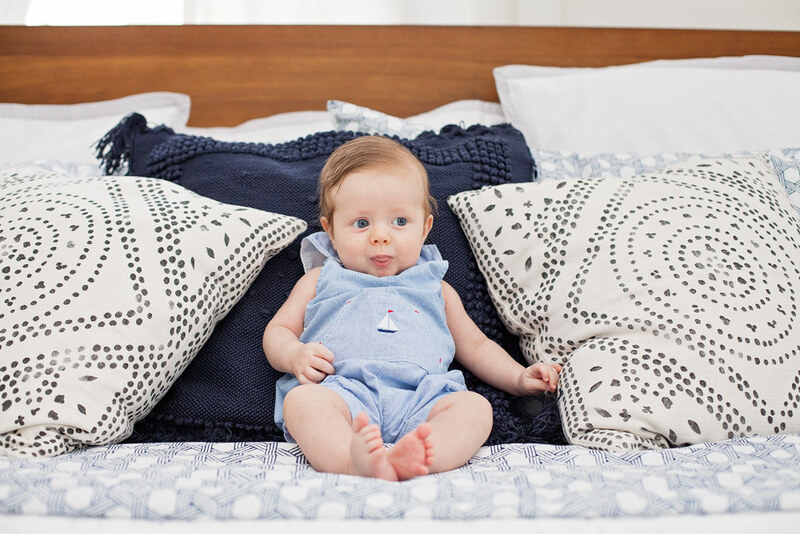 The pillows from Serena & Lily tend to have a nautical feel. Depending how you style each pillow, they can certainly fit in with your home’s aesthetics. We love the clean patterns and rich textures, like the Montecito and Camille Damond Medallion. It’s time to switch out the duvet and down comforter and change it out for a beautiful quilt. We wanted a cover that provided warmth, without the bulk. With five us in the bed, it can get really warm in the summer. The lightweight Chambers quilt from Serena & Lily provides the right around of warmth for our family, while also providing a rich texture neutral for our king size bed. Having a king size bed and not having a massive bedroom, it was super important not to overextend on color or pattern with the quilt. 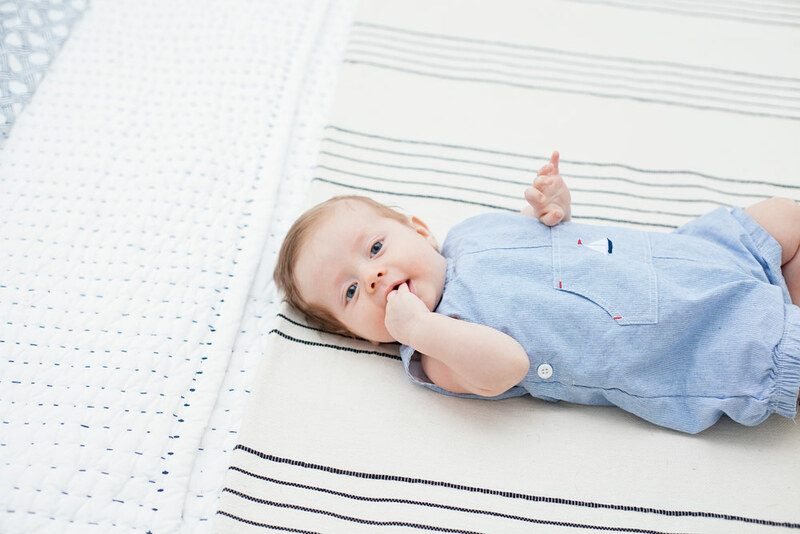 We love the subtle navy stitch and classic feel of the quilt. It was just the right amount texture for the room. This post was created in collaboration with Serena & Lily, as always, all words, opinions and photography are my own. I love those baskets you used! I have been looking for something similar for our room, both for decoration and to store extra blankets we needed in winter but won’t be needing in summer. Will have to get some of these! Love your Spring updates, Olivia! Your bedroom looks so bright and welcoming! You have a great space! I love those baskets- so fun and functional! 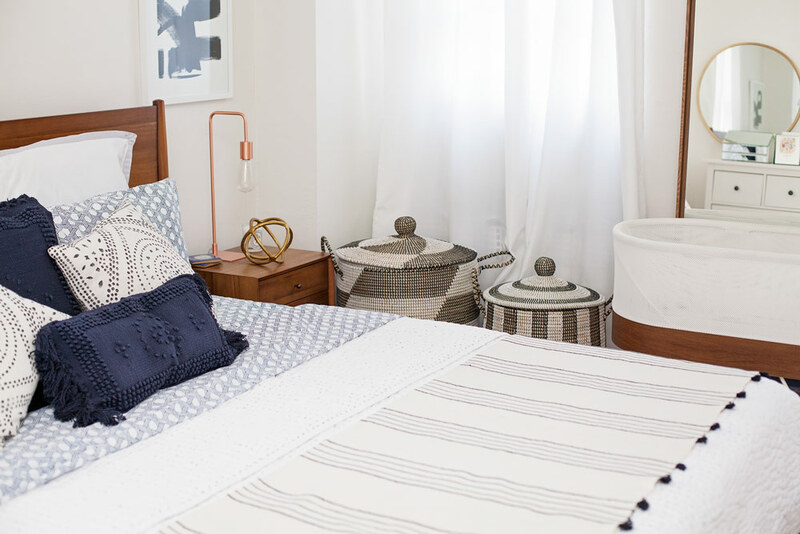 Loving also the striped throw with tassels, and that quilt looks so soft and comfortable. Thanks for sharing!